Since 2016, she has worked as a Spacecraft Contamination Control Engineer at NASA’s Goddard Spaceflight Center. Stewart supports integration and testing on the James Webb Space Telescope, which will launch in 2021 to investigate every phase of cosmic history, including the first stars and galaxies formed in the early universe, our solar system, and extrasolar planets that may support the building blocks of life. 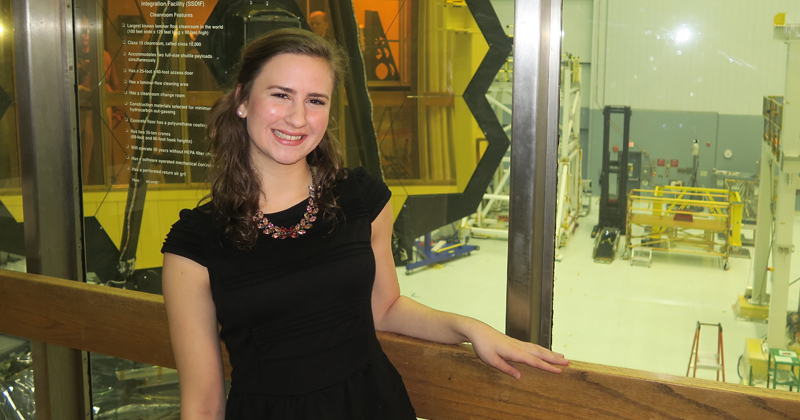 She came to this role equipped with skills she learned in internships, including one at Kennedy Space Center funded by the Delaware Space Grant Consortium, and stints as an undergraduate research assistant for professors April Kloxin, Norman Wagner, and John Gizis. Stewart works with Dr. Wagner on shear thickening fluid, a cushioning and movement-responsive material, for astronauts’ spacesuits. “Using this shear thickening fluid will allow the astronauts to have an extra layer of protection on their space suits from micrometeoroids in space or puncture from tools,” said Stewart. Stewart’s work has gotten plenty of notice. She was recognized by the International Society for Optics and Photonics (SPIE) in their 2018 SPIE Women in Optics Planner, a yearly publication that features inspiring women in science. In addition, she was recently featured in the “Faces of Photonics” campaign. At the 2018 Annual American Institute of Chemical Engineers (AIChE) Student Conference, she won first place in the Materials Engineering and Sciences category for her research poster on the optimization of shear thickening fluid formulations for aerospace applications.